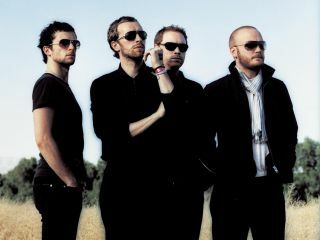 Coldplay love their fans. But they might love soccer a little more. Last Saturday (Sept. 6), they kept concert fans in Spain waiting for over an hour so they could watch a soccer game. The band were due to perform at the Palau Sant Jordi arena in Barcelona, Spain but postponed it when they realized England were playing a World Cup qualifying match against Andorra in the Olympic Stadium, which is next door. According to a source, "The band were delighted when they realized they were playing next to the England match and had to get tickets. They even postponed their show by an hour so they could watch the game. "But when they did get on stage, their performance kicked England's into touch." Many Coldplay fans left the soccer match - which England won 2-0 - after the first half because they were worried about missing the concert. You might think the audience would resent the long wait, but they gave the band a riotous welcome when they finally took to the stage, prompting frontman Chris Martin to thank the crowd. "Thanks for putting up with all the England fans today," he said. After the show, Martin spoke backstage. He claimed that the band's latest success - which saw their album Viva La Vida Or Death And All his Friends debut at number one in numerous charts internationally - is down to changing musical tastes. "It doesn't matter now if music is cool or not," he said. "People will buy it if they like it." And apparently they'll indulge rich rock stars who want to kick back and watch soccer when they should be hitting the stage.